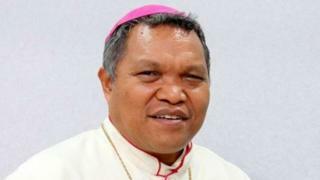 Image caption The outgoing bishop said allegations that he had a relationship with a woman were "slanderous"
Pope Francis has accepted the resignation of an Indonesian bishop accused by his own priests of having a mistress and appropriating more than $120,000 in church funds. Bishop Hubertus Leteng has previously denied any crime but gave no reason on Wednesday for his sudden exit. At 58, he is leaving 17 years before the usual retirement age for a bishop. The Vatican had been probing claims that he secretly borrowed $94,000 from the Indonesian bishops' conference. He is also alleged to have taken $30,000 from his diocese without accounting for either sum of money. Nearly 70 priests were reported to have resigned in June in protest over the bishop's actions - leading to the Vatican inquiry. Bishop Leteng argued at the time that the cash was used to educate impoverished young people. The Catholic Herald reported in June that told priests some of the cash was used to finance a youth from a poor family who was studying to be a pilot in the US. He said that allegations that he had a relationship with a woman were "slanderous". The Vatican has not explained why the bishop is retiring early, nor publicly discussed the allegations against him. The Ruteng diocese over which he presided also made no mention of the allegations in its announcement of his temporary replacement on Wednesday.